Someone once said that football was a game of two halves. I think it was Andy Gray actually, but that only accentuates how stupid the quote is. Somehow however, it makes sense when referring to our game Saturday. It ended Arsenal 3 - 0 Burnley, but it took a long 70 minutes for the Gunners to get off the mark. The first half saw us control the game, as usual. It also saw us get some decent shots off, but nothing to really make Burnley check their pants. What it didn't see us do was score, but you almost smelled something different about this game. You could say it was the opposition that made us look so steady, and you would probably be correct, but you've also got to look at how Arsenal played, not just how average Burnley were. We've been guilty of letting in an early goal (usually our opponents first shot on goal, against the run of play), and we've also been accused of letting a lead slip because of our lack on concentration. Saturday, however, I thought the boys in Red & White were not only calm and collected, but really showed a level of consistency that essentially won them the game. Of course we had to come out in the second half and up our game, which we did, but throughout the game the attitude of our players didn't change much at all. What I mean is, we didn't panic and start playing silly balls (a couple of muffed shots that ended up in Sheffield don't count), we stayed calm, controlled possession and relied on Sanchez to win us the game had the patience to get the goals late in the game. Sanchez did his apparently usual act of running every single ball down, every single minute of the game, and you really can't say enough about this fella at the moment. When watching with friends from Arsenal Detroit, we discussed whether he could be mistaken for being selfish on the ball, but, as one of us pointed out, a guy willing to take the shot when the shot is there to be taken is exactly what Arsenal need at the moment. At the end of the day 3-0 is probably a result that we should expect against a struggling, newly promoted Burnley, and I can't say the performance was anything more than that either but it was solid, organized and most importantly consistent. 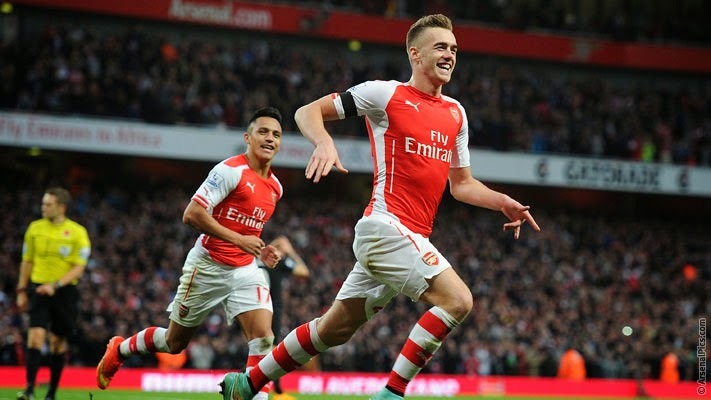 Congrats to Calum Chambers for getting his first goal for Arsenal, and who said Arsenal can't score scrappy goals? Sanchez though... I think we're watching one of the best players in the Premiership right now, and he's got a cannon on his chest. Long may his Arsenal career continue. Next up, Anderlecht, but this time at The Emirates. Tuesday could see us qualify for the knock-out stages of the Champions League for the 17th time in a row. While there's not much to rotate as far as the defense in concerned, I would expect to see Walcott, Ramsey, Podolski, Rosicky, Bellarin and perhaps even Sanogo get some minutes.